A group of 22 migrants from Honduras, Guatemala and Salvador await processing underneath the Paso Del Norte Bridge on March 28, 2019, in El Paso, Texas. 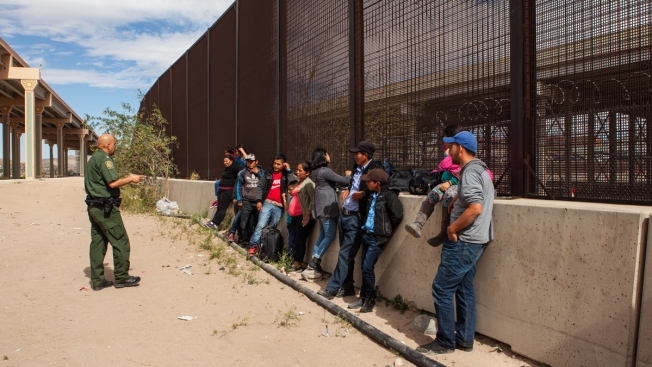 U.S. Customs and Border Protection has temporarily closed all highway checkpoints along the 268-mile stretch of border in the El Paso sector to try to stem a surge in illegal entry. Department of Homeland Security Secretary Kirstjen Nielsen will ask Congress for the authority to deport unaccompanied migrant children more quickly, to hold families seeking asylum in detention until their cases are decided and to allow immigrants to apply for asylum from their home countries, according to a copy of the request obtained by NBC News.